IPS Flow Systems, are up and ready to welcome visitors to FIREX International which starts today at The Excel in London. This is the only event that connects the global fire and security markets giving access to the very latest technology from suppliers across the world. Over the course of the last 20 years, the UK has witnessed a “quiet revolution” in the uptake and use of Automatic Fire Sprinkler systems to combat fire in Residential buildings. 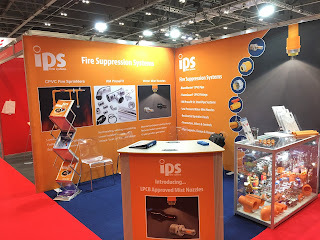 IPS the UK’s leading supplier of CPVC Fire Sprinkler products will be exhibiting our new range of mist nozzles and there will be demonstrations of the RM Pressfit system.